374 left in stock, Hurry! Horipenis Professional Tattoo Stencil Markers are designed to permit crisp, clean freehand stencil designs. Artists can draw directly onto their client’s skin with Horipenis markers, which come equipped with dual tips, thick and thin, for versatility. The Horipenis Tattoo Stencil Marker is remarkable for its lasting ink; 80% of the ink will stay on a client’s skin, even after the site is washed with green soap. 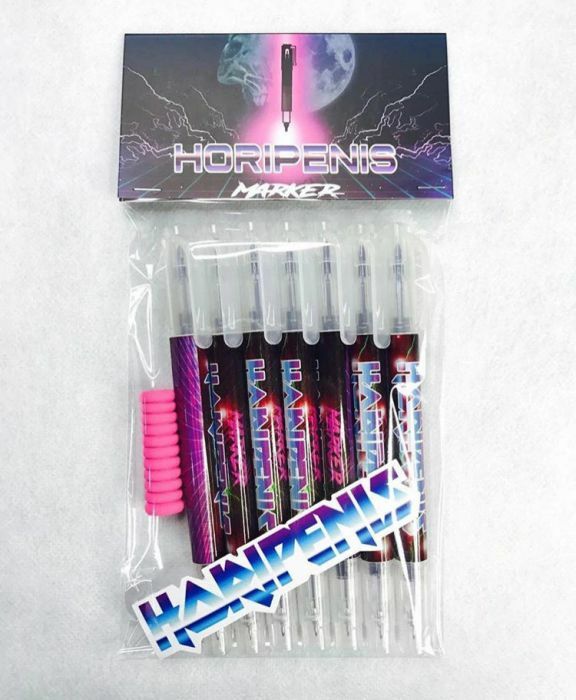 This listing is for one pack of 7 Horipenis Tattoo Stencil Markers, which are intended for professional use only. The set comes complete with a foam grip and a Horipenis promotional sticker. Make sure the skin is properly cleaned and dried before using the Horipenis. If you used other markers with lighter ink for the initial sketch, you can use the Horipenis marker for the final lines. Make sure that the previous marker has dried before using the Horipenis marker over top of it. Allow the Horipenis marker ink to dry for 10 minutes before tattooing.